From Cirò Marina to Isola di Capo Rizzuto, passing through the city and hinterland of Crotone. Famous for the crystal clear waters which caress its coastline, Cirò Marina is one of the most popular tourist destinations on the Ionic coast of Calabria. In addition to being a fashionable bathing resort, Cirò Marina is a town rich in history and art, home to important archaeological sites such as the temple of Apollo Aleo, dating back to the 6th century B.C. Great part of the material found during excavation work - including vases, ceramics and other objects used in everyday life - is exhibited in the town's Archaeological Museum, in Piazza Diaz. So as to reach Crotone, we travel for a few kilometers along a stretch of low lying coast, in the company of a magnificent display of Mediterranean flowers and plants which flourish thanks to Calabria's wonderfully mild climate. During the journey, we make a short detour inland so as to visit the small Byzantine town of Santa Severina, a town of truly ancient origin considered to be one of the most beautiful in the whole of Italy. 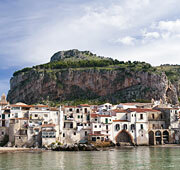 Santa Severina, perched on a great spur of tuff rock, still bears the traces of its past Greek and Byzantine dominion. 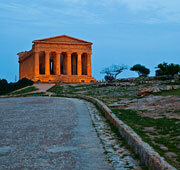 Crotone is the largest town in the area, divided in two parts, that of the new and old city. 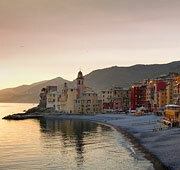 Crotone's nightlife gravitates around Via Cristoforo Colombo, the city's vibrant seafront promenade. Symbol of the old city and dominating the port, the Carlo V Castle is a massif stronghold constructed so as to defend the city from attacks from the sea, inside which a Museum containing a fascinating collection of medieval armory and weapons can now be visited. Situated only a few meters away from Capo Colonna, the medieval Torre Nao, provides a unique venue for the town's Antiquarium Museum. This Spanish tower marks the beginning of the Capo Rizzuto Protected Marine Area. Divided in three areas, this Calabrian marine reserve is one of the most important in the whole of the Mediterranean, a place where to practice every genre of underwater sports and explore waters inhabited by groupers, barracudas, sometimes even dolphins. 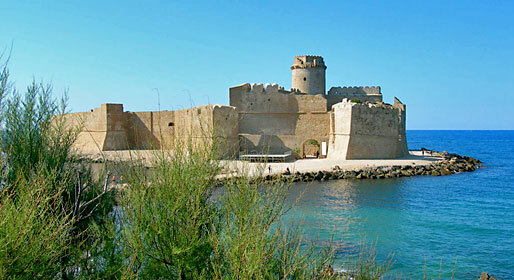 Those wishing to admire the fine sandy beaches, promontories and bays of Capo Rizzuto from the sea can do so aboard one of the sailing boats which depart from the tourist port of Le Castella.